Kashmir is the beauty of Dal Lake at sunset: the friendly shikarawalas, the mesmerized tourists and the houseboats with cheesy names. It is children slurping away at their softies. It is a family sitting around a trami, eating wazwan. It is picnics at Pahalgam, towering mountains and the sound of gushing streams. It is nomads herding their sheep. It is bakarkhanis, samovars and noon chai. It is golden leaves on chinar trees. It is Muslims and Hindus praying side by side at the Baba Reshi shrine. It is paradise on earth. Not only this, though. Kashmir is also barbed wire, contentious borders and government forces on every street corner. It is a lack of faith in political entities. It is too much trauma, too few psychiatrists. It is Kashmiri Pandits who left the valley, afraid for their lives. It is armed rebels who are fighting against the Indian rule since 90s. It is the tragic tale of Neelofar and Asiya. It is the half-widows who don’t know if their husbands are still alive and ex-militants who have put down their guns now. It is calls for hartal. It is teenage boys who throw stones at men in uniform in a show of defiance. It is bullets to their heads; it is bloodstained streets. It is wounds that are left to fester. How do you convey such complexity; where do you start? KAQ and its Managing Director, Syed Mujtaba Rizvi, had a dream: to send a huge blank canvas across 18 cities in 12 different countries so 200 artists can come together and contribute their visual interpretations of Kashmir. In each city, a group of artists work on the canvas, essentially creating one giant collaborative art piece representing a kaleidoscopic vision of Kashmir. This dream is becoming reality as I write this, and the progress is constantly documented on the organisation’s blog. The Kashmir Walla is the media partner of this project. The canvas will travel to the US, the UK, India, Pakistan, South Africa, Malaysia, Australia, Turkey, Iran, Brazil and Switzerland. And renowned Kashmiri artists like Masood Hussain and Iftikhar Jaffar have also contributed their visions of Kashmir. The project will be open to the public in each city, in effect “creating a massive conversation about Kashmir – its art and its culture, around the world,” Rizvi says. The completed canvas will then come home to Kashmir and become a permanent public installation by the banks of Dal Lake in Srinagar. But it doesn’t stop there. All contributing artists will become members of KAQ’s international artists collaborative, Arts Network Kashmir. There will be video-conferences between artists and online content sharing. A book, documenting the project’s journey from start to finish, will be published and made available globally. According to Rizvi, the project has three main aims. First: to create a global conversation, an intellectual discourse, about Kashmir. Second: to put the Kashmiri contemporary art scene on the global map. And third: to enrich the cultural infrastructure in Kashmir. “When we are in Kashmir we like to think that Kashmir is ‘world famous’. We call it paradise on earth and constantly use phrases like “world famous Dal Lake,” Rizvi says. “Unfortunately, once you leave the South Asian region, a lot of people don’t really know much about Kashmir.” Rizvi attributes part of this lack of awareness to an inability to manage what he calls brand Kashmir and hopes Keep the Canvas Rolling is a step in the right direction. For such a dynamic and expansive project it’s inevitable that logistics would be complicated. Rizvi says Keep the Canvas Rolling took six months of planning: talking to friends and friends of friends, hundreds of emails, calls and Skype sessions and of course, the determination to make it happen. As the project is underway, KAQ is constantly in touch with coordinators in every city, who receive the rolled canvas via courier. From its inception in 2009, KAQ was aware of the restrictive artistic atmosphere in Kashmir. “In Kashmir there is censorship from every side,” Rizvi says. “Often even self-censorship.” As a result KAQ has made it their mission to execute some of the most extraordinary projects in the region with an aim to rediscover, revive and promote the arts industry in Kashmir. Past initiatives include J-K’s largest annual contemporary art show, international art exchange programs, film screening events and research projects. Through Keep the Canvas Rolling, Rizvi says, KAQ is pushing the boundaries of art and hopes budding artists in Kashmir always keep experimenting. “Don’t be scared to be shocking or provocative or challenge preconceptions,” Rizvi says. Rizvi was born in Kashmir in 1988, spent several years abroad and went to university in Mumbai, but he lived in Kashmir long enough to fall in love with the place. “Kashmir is home. It is who I am or whatever I become,” he says. In 2012, after his undergraduate degree, he attended Goldsmiths, University of London where he was exposed to London’s vibrant art scene and a remarkably talented and multi-cultural group of people. Rizvi says that he wouldn’t have been able to have such an expansive outreach for Keep the Canvas Rolling had he not been to Goldsmiths. “When I left my studio at the end of summer at Goldsmiths, I and some of my other artist friends signed a blank wall in our native languages,” Rizvi said. “I knew right there that we would send a blank canvas around the world.” Today, the project has become much more than just a blank canvas sent around the world. 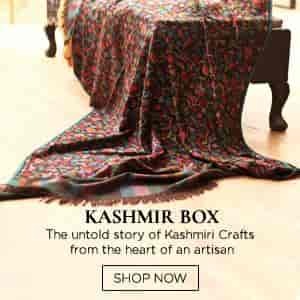 Keep the Canvas Rolling is a prime example of how innovation can defy the stale narrative of Kashmiri victimhood. Kashmiris are telling Kashmir’s story. The world is telling Kashmir’s story. Through this project, Rizvi and KAQ have managed to channel collective creative energy into something explosive. And as the canvas keeps rolling, it will be fascinating to see where artistic initiatives like these lead the global conversation on Kashmir.